This article is about the historical spy ring and the spymasters. For the fictional spy ring from Y: The Last Man, see Culper Ring (comics). The Culper Ring was a spy ring organized by American Major Benjamin Tallmadge under orders from General George Washington in the summer of 1778, during the British occupation of New York City at the height of the American Revolutionary War. The "Culper" name was suggested by Washington, who devised it from Culpeper County, Virginia. The two main members of the ring were Abraham Woodhull and Robert Townsend, who used "Samuel Culper, Sr." and "Samuel Culper, Jr.", respectively, as aliases. Tallmadge was referred to by the alias "John Bolton." Tallmadge was in direct contact with the ring, but Washington often directed its operations. The ring's task was to send messages to General Washington about the activities of the British Army in New York City, the British headquarters and base of operations. The members of the ring operated mostly in New York City, Long Island, and Connecticut. Their covert operations started in late October 1778 and continued through the British evacuation of New York in 1783, but its heyday was between 1778 and 1781. The Culper Ring provided valuable information to General Washington, including the fact that the British planned a surprise attack on the newly allied French forces under Lieutenant General Rochambeau at Newport, Rhode Island, before the French could fully recover and set up defenses after their arduous sea journey to America. They also reported that the British planned to counterfeit American currency on the actual paper used for the Continental dollars, prompting the Continental Congress to retire the bills. The ring learned that Major General William Tryon's raid in Connecticut in July 1779 was a diversion to induce Washington to divide his forces, so that Lieutenant General Sir Henry Clinton could attack them piecemeal. And they discovered that a high-ranking American officer had been plotting with British Major John Andre to turn over the vitally important American fort at West Point, New York on the Hudson River and to surrender its garrison to the British—subsequently shown to be Benedict Arnold. The Culper Ring is often credited with the exposure of an attempt on Washington's life, but no official record of an attempt exists. Washington became convinced that well-organized intelligence was a necessity after several intelligence failures, including the capture and execution of Nathan Hale. Before Howe moved from Staten Island, Washington received information of varying utility from individual agents such as Lawrence Mascoll, who obtained some intelligence on Staten Island before August 23. After evacuating his troops from Brooklyn Heights, Washington asked Brigadier General William Heath and New York militia general George Clinton to set up "a channel of information" on Long Island, but he did not yet try to establish permanent agents behind enemy lines. His next agent was Captain Nathan Hale, who was captured during his effort to obtain intelligence in New York City by Loyalist ranger Lieutenant Colonel Robert Rogers; Hale was executed by the British on September 22, 1776. By January 1777, Washington thought that civilians would attract less attention as spies and that they must recruit other agents to gather intelligence. He asked William Duer to recommend someone to be the agent, and Duer recommended colleague Nathaniel Sackett. Washington appointed Captain Benjamin Tallmadge to be Sackett's contact with the army, as he was a classmate and friend of Nathan Hale. Sackett had developed some advancements and new methods for spying, such as keeping an agent in enemy territory and finding a means of regular communication, which he detailed in a letter to Washington on April 7. He discovered that the British were building flat-bottomed boats to use in a campaign against Philadelphia; he did not produce enough correct intelligence fast enough for Washington, however, and he was soon paid and dismissed. Early in 1777, American Colonel Elias Dayton set up a spy network on Staten Island to work in parallel with established American intelligence agent John Mersereau. Washington failed to stop the British at the Battle of Brandywine on September 11, 1777, and they took Philadelphia on September 26. The focus of intelligence gathering then switched to Philadelphia, and Washington assigned Major John Clark, who had returned to the army after being severely wounded in a skirmish before the Battle of Brandywine. Clark set up a successful network of spies, but his unhealed wound and constant exertions wore him out, and he had to retire to a desk job. The focus of intelligence gathering returned to New York, where Washington lacked a spy network. On August 7, 1778, Washington received a letter from Lieutenant Caleb Brewster at Norwalk, Connecticut with an offer to report on the enemy, to which Washington cautiously agreed and replied with advice. Brewster sent his first report on August 27, including the condition of British warships after a storm and some battles with French warships at the beginning of the Battle of Rhode Island. He also reported that several regiments of British troops were boarding ships bound for Newport, Rhode Island. Washington assigned General Charles Scott to handle Brewster and find additional agents, and he asked Major Benjamin Tallmadge to assist Scott. Scott had many other duties and he found intelligence work uninteresting, so Tallmadge did most of it. Washington soon directly asked Tallmadge to recruit people who could be trusted to collect intelligence in New York City. Tallmadge recommended Abraham Woodhull of Setauket on Long Island as a contact for Brewster who was a childhood friend of both Brewster and Tallmadge. He had been taken prisoner by an American ship a few months earlier and charged with illegal trading, of which he was in fact guilty. He was held in Connecticut until Tallmadge quietly talked with Governor Jonathan Trumbull, who released him. Before Woodhull left Connecticut, Tallmadge spoke with him about joining Washington's secret service. Tallmadge had dinner with Washington and Scott on August 25, during which he convinced Washington that Woodhull was trustworthy, Washington suggested the alias "Samuel Culper" after Culpeper County, Virginia where he had worked as a surveyor in his youth. Tallmadge was not getting along well with the difficult Scott, and their approaches to spying differed. Scott wished to continue using single-mission agents to sneak in and out of enemy lines, while Tallmadge favored embedding spies in enemy territory and establishing a secure line of communication back to base. Scott lost three out of five agents sent to spy on the British in New York City in early September, and Washington decided that Tallmadge's method should be used. He was communicating directly with Tallmadge as early as October 22 about setting up a network with Woodhull and Brewster. On October 29, Scott resigned as chief of intelligence, and Washington assigned Tallmadge to lead the intelligence network. Woodhull would go to New York City every few weeks to gather intelligence. His married sister Mary Underhill lived there, giving him a reason to visit. He was questioned at a British checkpoint on October 31, 1778, increasing his anxiety about the dangerous mission, but he returned to Setauket with valuable information about the British supply fleet. He provided a precise report on November 23 with the identity of British units and the numbers of troops and dispositions in New York City, proving his worth as a spy. Woodhull soon recruited his brother-in-law Amos Underhill to gather intelligence, who ran a boarding house in the city with his wife Mary, but Underhill's reports were often too vague to be of much value. At first, Woodhull had to return to Setauket to pass messages to Caleb Brewster which Brewster would take to Tallmadge, or to receive messages from Tallmadge via Brewster. Tallmadge set up couriers in December who would take messages the 55 miles (89 km) between New York and Setauket, initially Jonas Hawkins then mainly Austin Roe beginning in the early summer. The courier's task was to get the letters to Brewster, who would pick up messages at one of six secluded coves near Setauket and take them across Long Island Sound with his rotating whaleboat crews to Tallmadge at Fairfield, Connecticut. Tallmadge would then take them to Washington's headquarters. This time-consuming task was replaced in January 1779 by the assignment of express riders to take the messages from Tallmadge to Washington. Local tradition claims that Anna Strong, a resident of Setauket and a friend and neighbor of Abraham Woodhull, helped pass along messages from the spy ring by posting pre-arranged signals to indicate when one of the spies was ready to submit intelligence. If she hung a black petticoat on her clothesline, it meant that Brewster had arrived in town in his whaleboat. Next to that, she would hang a quantity of white handkerchiefs to indicate which of the six hiding places he was in. Woodhull used her signals to meet Brewster or to drop messages at one of the meeting places. Historian Richard Welch writes that the tradition of the clothesline signal is unverifiable, but it is known that the British suspected a woman at Setauket of Patriot activities who fits Anna's profile. Brewster occasionally would add his own report to the Culper messages. In a January 1779 report received by Washington in early February, Brewster sent some information about naval matters and boat building at New York City and warned that Loyalists were outfitting privateers for operations on Long Island Sound. This was with a message from Woodhull which precisely described the British regiments and commanders at the northern tip of Manhattan, totaling about 8,500 men. Woodhull also reported on British boat-building, confirming Brewster's report. Tallmadge and Washington thought that the boats might be planned transport for an attack against Connecticut from Major General William Tryon, who had conducted a raid during the winter. In late June, Washington sent a letter to Tallmadge in which he identified George Higday as a possible operative to relieve Woodhull in New York City. The British had intercepted a June 13 letter from Washington referring to "C_____" and Tallmadge. On July 2, British cavalry under the command of Colonel Banastre Tarleton attacked Tallmadge's camp and captured his horse and some papers, including the letter mentioning Higday. They were trying to capture Tallmadge himself because they knew that he was head of Washington's intelligence operation. The second letter confirmed that an agent C______ was operating in New York City and that Tallmadge was the chief intelligence officer for Washington. Higday escaped execution but was of no use as a spy to Washington or to Clinton, who tried to recruit him as a double agent. Woodhull reported that he could not continue to operate in New York City after the visit from Simcoe in June because he was under suspicion, but he had a new agent lined up and would go to New York to finalize arrangements with him. In June 1779, Woodhull engaged Robert Townsend to gather intelligence in New York City, using the alias "Samuel Culper, Jr." Townsend was engaged in business there, and his presence would arouse less suspicion than Woodhull's visits. He also had access to British officers through several channels, including his own tailoring business. He wrote a society column in a Loyalist newspaper, and he owned an interest in a coffeehouse with Loyalist newspaper owner James Rivington, who also was a secret member of the Ring. Once Townsend began his intelligence activities in New York City, Woodhull operated almost exclusively from Setauket, and he revised the communications network. Townsend would pass intelligence to a courier—initially Hawkins, then Hawkins and Roe, and exclusively Roe after September 1779—who would take it to Setauket and pass it to Woodhull, usually via dead drop in a box hidden in a field which Roe rented from Woodhull. Woodhull would evaluate and comment on it and pass it to Brewster, who would take it across Long Island Sound, occasionally adding an intelligence note of his own, and pass it to Tallmadge. Tallmadge would usually add a cover letter with comments, and he sent and received messages by a relay of dragoons acting as couriers. Hawkins was bold at first, but he became increasingly anxious about British patrols. His role was reduced between April and July, when Tallmadge assigned a code number to Roe in his code directory but not to Hawkins. Woodhull wrote in a coded message on August 15 that Hawkins had to destroy a letter from Culper, Jr. or be captured. He also wrote that Hawkins insisted that his next meeting with Townsend be in an out of the way location. Townsend did not like taking the additional risk and was beginning to doubt Hawkins' reliability and to regret the destroyed messages. Hawkins finally stopped his courier services for the Ring in September 1779, as Townsend refused to deal with him any longer. Woodhull acted as courier on September 11 so that he could explain to Townsend the loss of the earlier letters, and Roe became the sole permanent courier for the Ring. Secrecy was so strict that Washington did not know the identity of all the operatives. Townsend was recruited by Woodhull and was especially insistent that his identity not be revealed, although Austin Roe and Jonas Hawkins needed to know him. Among the techniques that the Ring used to relay information were coded messages published in newspapers and invisible ink, called a sympathetic stain, to write between the lines of what appeared to be typical letters. In the first months of the Ring's operations, they were forced to rely on crude tactics to conceal their information before a complex web of codes and invisible ink were accessible, so they relied on a small number of codes for memory. Woodhull used the codes 10 (New York), 30 and 40 (Post Riders), and 20 (Setauket) in his first letter of correspondence. Tallmadge realized the significance of creating a code book to increase their vocabulary. By July 1779, he had completed pocket dictionaries with lists of verbs, nouns, people, and places with their corresponding code number. These dictionaries were given to General Washington, Woodhull, Townsend, and Tallmadge himself, to ensure that it did not get into enemy hands. With the use of the codes, the letters were very complex and required much effort to write and comprehend. The code book was a way that Washington made sure that the Culper Ring spies had more support and operated in greater secrecy than previous Continental spies, perhaps with Nathan Hale in mind. Tallmadge, Woodhull, and Townsend were given code names and code numbers, along with Washington, Brewster, Roe, and Rivington. George Washington's code number was 711. Hercules Mulligan was recruited to spy for the Continental Army in New York City by Alexander Hamilton. He was born in 1740, was a friend of Townsend's father, and was an active member of the Sons of Liberty. He had taken in Alexander Hamilton when Hamilton arrived in New York as an orphan in 1773 to attend King's College, and he had helped Hamilton obtain a commission in the army. He was married to Elizabeth Sanders, daughter of a Royal Navy admiral, and he also had a fashionable clothing business near Robert Townsend's establishment—and these things gave him access to officers who would talk to him about military matters. Mulligan began his activities in late 1776 or early 1777, well before formation of the Culper Ring. Historian Stephen Knott says that Mulligan cooperated with the Culper Ring, but mostly operated as a lone agent. Alexander Rose states that Mulligan gave Townsend information which Townsend added to his reports. Mulligan's slave Cato was his "faithful accomplice" in his intelligence activities. In January 1779, Cato delivered a message from Mulligan to George Washington's aide Alexander Hamilton that the British planned to kidnap or kill American leaders, including Washington and New Jersey Governor William Livingston. Mulligan had received the information from his brother Hugh, who was with Kortright and Company, a contractor for the British Army. The British arrested Mulligan on suspicion of espionage after Benedict Arnold defected in New York. Townsend ceased his activities for a time for fear that he, also, would be discovered. Woodhull passed on the information concerning Townsend's dejection and concern over the arrest of "one that hath been ever serviceable to this correspondence." Arnold did not have any hard evidence against Mulligan, so he was released, but he may have spent as many as five months in prison, until February 1781, and he continued to pick up intelligence after his release. He discovered that the British planned to ambush Washington while he was on his way to a meeting with Rochambeau on March 5, 1781. Mulligan and Cato remained under suspicion and could not communicate directly with Washington's headquarters, so Mulligan gave the information to Townsend, who sent it to Washington via the Culper Ring network. The message arrived in time for Washington to avoid the trap and travel to the meeting by another route. The members of the ring gathered information from a variety of sources, including persons other than unwitting British officers. Some of those informants or associates included Joseph Lawrence, a Long Island resident; Captain Nathan Woodhull, Woodhull's uncle who served as a Loyalist militia officer but provided information to Abraham Woodhull; Nathaniel Ruggles, a schoolmaster and physician born in 1713; Joshua Davis, a Brewster deputy and occasional substitute; George Smith, a whaleboat man who filled in for Brewster near the end of the war; and William T. Robinson, a merchant. Alexander Rose writes that John Cork was a code name for an unidentified informant. Harry Thayer Mahoney writes that John Corke of Groton, New York posed as a Tory and could travel back and forth to New York City because he was "exceedingly intimate at British headquarters." Corke wrote intelligence reports to Tallmadge in invisible ink or reported verbally to him. Mahoney states that Washington and Tallmadge considered Corke a valuable recruit for the Culper Ring. A letter by loyalist soldier Nehemia Marks was uncovered in 2015 which identifies brothers Nathaniel and Phillip Roe as supporters of the spy ring, with Nathaniel providing intelligence and Phillip material aid. The letter also provides evidence that the Culper ring operated in Drowned Meadow beyond Setauket and Oyster Bay, as previously believed. The letter is housed in the William L. Clements library at the University of Michigan, where it was discovered by a former resident of Port Jefferson researching the Culper Ring. Some sources note a female member of the ring known only as Agent 355, while others believe that this code number referred to Anna Strong or was simply a misunderstanding of a cryptic reference in one of Abraham Woodhull's letters. Other women were informants for the Culper Ring, such as Robert Townsend's sister Sarah (Sally) Townsend and Abraham Woodhull's sister Mary Underhill, who provided important information about Major John Andre and his alias of John Anderson, according to some sources. The general public was unaware of the Ring's existence until the 1930s. 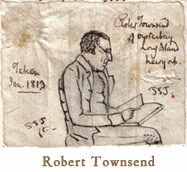 Robert Townsend's identity as "Culper, Jr." was discovered in 1929, with the examination of old letters written by Townsend in the Townsend family home. Historian Morton Pennypacker reviewed the letters and noticed that the handwriting in letters from the trunk, written by Robert Townsend, was similar to handwriting in letters written by "Samuel Culper, Jr." in George Washington's collection. Other evidence later corroborated Townsend's identity. James Rivington was confirmed by scholars to be a member of the ring only in the 1950s. Agent 355 has become a part of popular fiction. She is the namesake of one of the main characters in Y: The Last Man from Vertigo Comics. In Sleepy Hollow season 2, episode 10, "Magnum Opus" (2014), Ichabod Crane dismisses the Parson Weems account of George Washington's honesty, pointing out that Washington's ties to the Culper Ring, whose agents engaged in deception, made him the revolution's "Liar-in-Chief". Sleepy Hollow season 3 reveals that Betsy Ross was secretly an operative of the Culper Ring. The 2014 AMC television show Turn: Washington's Spies, based on Alexander Rose's history book Washington's Spies: The Story of America's First Spy Ring (2006), tells a semi-fictionalized version of the story of the Culper Ring, with a focus on Abe Woodhull and his correspondance with Washington during the war. ^ a b c d Rose, Alexander (2007). Washington's Spies: The Story of America's First Spy Ring. New York: Bantam Dell, a division of Random House. p. 75. ISBN 978-0-553-38329-4. ^ Rose, 2007, pp. 75, 132. ^ Mahoney, Henry Thayer and Marjorie Locke Mahoney. Gallantry in Action: A Biographic Dictionary of Espionage in the American Revolutionary War. Lanham, MD: University Press of America, Inc., 1999. ISBN 978-0-7618-1479-5. p. 307. ^ Rose, 2007, pp. 258–261. ^ Rose, 2007, p. 14. ^ Rose, 2007, p. 15. ^ Rose, 2007, p. 16. ^ Rose, 2007, pp, 16–18, 27–32. ^ a b c Rose, 2007, p. 42. ^ Rose, 2007, pp. 4–6, 43. ^ Rose, 2007, pp. 48–49. ^ Rose, 2007, p. 50. ^ Rose, 2007, pp. 51–52. ^ Mahoney, 1999. ISBN 978-0-7618-1479-5. p. 126. ^ a b Rose, 2007, p. 59. ^ Rose, 2007, p. 62. ^ a b Rose, 2007, p. 67. ^ Rose, 2007, pp. 70-71. ^ a b c d Rose, 2007, p. 71. ^ Tallmadge, Benjamin. Memoir of Col. Benjamin Tallmadge. New York: Thomas Holman, 1858. OCLC 15547874. Retrieved April 25, 2014. p. 68. ^ Mahoney, Gallantry in Action, p. 177. ^ Rose, 2007, pp. 71–79. ^ Kilmeade, Brian and Don Yaeger. George Washington's Secret Six: The Spy Ring That Save the American Revolution. New York: Penguin Group, 2013. ISBN 978-1-59523-103-1. p. 58. ^ Schellhammer, Michael. George Washington and the Final British Campaign for the Hudson River, 1779. Jefferson, NC: McFarland and Co., Inc., 2012. ISBN 0786468076. p. 45. ^ Sharp, Arthur G. Not Your Father's Founders: An "Amended" Look at America's First Patriots. Avon, MA: Adams Media, 2012. ISBN 978-1-4405-4011-0. p. 240. ^ Rose, 2007, p. 72. ^ a b Rose, 2007, p. 79. ^ Rose, 2007, pp. 72, 74. ^ a b Rose, 2007, p. 74. ^ Kilmeade, 2013, p. 52. ^ Rose, 2007, p. 76. ^ Rose, 2007, pp. 76–77. ^ Rose, 2007, p. 78. ^ a b Rose, 2007, p. 88. ^ a b Rose, 2007, p. 90. ^ Kilmeade, 2013, p. 46. ^ Rose, 2007, p. 89. ^ Rose, 2007, pp. 93–94. ^ Kilmeade, 2013, p. 59. ^ Rose, 2007, p. 92. ^ a b c Rose, 2007, p. 101. ^ a b c Rose, 2007, p. 102. ^ a b c d Nelson, David Paul. Culper Ring in Hastedt, Glenn, P., ed. Spies, Wiretaps, and Secret Operations: A-J. Santa Barbara, CA: ABC-CLIO, 2011. ISBN 978-1-85109-807-1. p. 217. ^ Mahoney, 1999, p. 309. ^ Naylor, Natalie A. Women in Long Island's Past: A History of Eminent Ladies and Everyday Lives. Charleston, SC: The History Press, 2012. ISBN 978-1-60949-499-5. Retrieved May 1, 2014. p. 38. ^ Kilmeade, 2013, pp.93–94, doubts that the laundry signals took place. ^ Welch, Richard F. General Washington's Commando: Benjamin Tallmadge in the Revolutionary War. Jefferson, NC: McFarland & Company, Inc., 2014. ISBN 978-0-7864-7963-4. p. 37. ^ a b c d Rose, 2007, p. 103. ^ Rose, 2007, p. 106. ^ a b c Rose, 2007, p. 113. ^ a b c d Rose, 2007, p. 129. ^ a b c Rose, 2007, p. 112. ^ Rose, 2007, p. 131. ^ a b Rose, 2007, p. 132. ^ Nelson, David Paul. Robert Townsend in Hastedt, Glenn, P., ed. Spies, Wiretaps, and Secret Operations: A-J. Santa Barbara, CA: ABC-CLIO, 2011. ISBN 978-1-85109-807-1. p. 763. ^ Rose, 2007, pp. 150–154. ^ "Raynham Hall Museum". raynhamhallmuseum.org. Retrieved 2016-05-31. ^ a b c d e f Rose, 2007, p. 172. ^ Kahn, David. The Codebreakers: The Comprehensive History of Secret Communication from Ancient Times to the Internet. New York, Simon and Schuster, 1996. ISBN 978-1-4391-0355-5. p. 179. ^ Kilmeade says that Hawkins destroyed Culper letters on two occasions for fear of being caught. Kilmeade, 2013, p. 100. ^ Kilmeade, 2013, P. 100. ^ Rose, 2007, pp. 106–110. ^ a b Pennypacker, Morton, General Washington's Spies on Long Island and in New York (Long Island Historical Society, 1939), 209. ^ Rose, 2007, p. 121. ^ Rose, 2007, pp. 224–226. ^ Mahoney, 1999, p. 253. ^ Bakeless, John. Turncoats, Traitors & Heroes. New York: Da Capo Press, 1998. Originally published New York: J. B. Lippincott, 1959. ISBN 978-0-306-80843-2. p. 240. ^ a b c Rose, 2007, p. 226. ^ a b c Rose, 2007, p. 224. ^ Rose, 2007, p. 225. ^ a b Knott, Stephen. Secret and Sanctioned: Covert Operations and the American Presidency. New York: Oxford University Press, 1996. ISBN 978-0-19-510098-3. Retrieved May 22, 2014. p. 40. ^ Misencik, Paul R. The Original American Spies: Seven Covert Agents of the Revolutionary War. Jefferson, NC: McFarland, 2013. ISBN 978-0-7864-7794-4. p. 116. ^ a b Misencik, 2013, p. 117. ^ a b c d e Misencik, 2013, p. 122. ^ Rose, 2007, pp. 173, 255–256, 265. ^ Rose, 2007, p. 255. ^ a b c Mahoney, 1999, p. 111. ^ Rose, 2007, p. 173 identifies Agent 355 as Anna Strong, but notes on p. 277 that she died in 1812, which is inconsistent with other accounts of 355's fate. Kilmeade, 2013, pp. 93–94 doubts that Anna Strong was Agent 355. He believes that Agent 355 was more likely to have been a younger woman living with a Loyalist family in New York and acquainted with British spymaster John André. Mahoney, 1999, p. 304 agrees that Agent 355 had access to British headquarters but identifies her as the mistress and common law wife of Robert Townsend, who died in childbirth in 1780 while confined on a British prison ship. ^ Misencik, Paul R. (2016). Sally Townsend, George Washington's teenage spy. Jefferson, North Carolina: McFarland & Company, Inc. ISBN 9780786499878. OCLC 910334343. Misencik provides an extensive account of Sally Townsend's role as a spy. ^ Weigold, Marilyn E. (2004). The Long Island Sound: A History of Its People, Places, and Environment. New York: NYU Press. ISBN 978-0-8147-9400-5. ^ a b Kilmeade, 2013, pp. xvi–xvii. ^ Mahl, Tom E. Espionage's Most Wanted: The Top 10 Book of Malicious Moles, Blown Covers, and Intelligence Oddities. Potomac Books, Inc., 2003. ISBN 978-1-61234-038-8. Retrieved May 1, 2014. p. 43. ^ Walker, Warren S. "The Prototype of Harvey Birch". oneonta.edu. Retrieved April 27, 2014. ^ Kilmeade, Brian (2013). George Washington's Secret Six. ^ White, Roseanna M. "The Culper Ring Series". RoseannaWhite.com. Archived from the original on 2014-05-31. ^ Mafe, Diana Adesola (2015). "'We Don't Need Another Hero': Agent 355 as an Original Black Female Hero in Y: The Last Man". African American Review. 48 (1): 33. Retrieved 18 April 2016 – via Project MUSE. (Subscription required (help)). Bakeless, John. Turncoats, Traitors & Heroes. New York: Da Capo Press, 1998. Originally published New York: J. B. Lippincott, 1959. ISBN 978-0-306-80843-2. Baker, Mark Allen. Spies of Revolutionary Connecticut: From Benedict Arnold to Nathan Hale. Charleston, SC: The History Press, 2014. ISBN 978-1-62619-407-6. Brady, Kevin M. Culper Spy Ring In Frank, Lisa Tendrich. An Encyclopedia of American Women at War: From the Home Front to the Battlefields. Santa Barbara, CA: ABC-CLIO, 2013. ISBN 978-1-59884-444-3. p. 172. Ferling, John. Almost a Miracle: The American Victory in the War of Independence. New York: Oxford University Press, 2009. ISBN 978-0-19-538292-1. (pbk.) Originally published in hard cover in 2007. Jones, Robert Francis. "The King of the Alley": William Duer, Politician, Entrepreneur, and Speculator, 1768-1799. Philadelphia: American Philosophical Society, 1992. ISBN 0-87169-202-3. Kahn, David. The Codebreakers: The Comprehensive History of Secret Communication from Ancient Times to the Internet. New York, Simon and Schuster, 1996. ISBN 978-1-4391-0355-5. Kilmeade, Brian and Don Yaeger. George Washington's Secret Six: The Spy Ring That Save the American Revolution. New York: Penguin Group, 2013. ISBN 978-1-59523-103-1. Knott, Stephen. Secret and Sanctioned: Covert Operations and the American Presidency. New York: Oxford University Press, 1996. ISBN 978-0-19-510098-3. Retrieved May 22, 2014. Leckie, Robert. George Washington's War: The Saga of the American Revolution. New York: Harper Perennial, a division of HarperCollins, 1993. ISBN 978-0-06-092215-3. First published 1992. Mahl, Tom E. Espionage's Most Wanted: The Top 10 Book of Malicious Moles, Blown Covers, and Intelligence Oddities. Potomac Books, Inc., 2003. ISBN 978-1-61234-038-8. Retrieved May 1, 2014. Mahoney, Henry Thayer and Marjorie Locke Mahoney. Gallantry in Action: A Biographic Dictionary of Espionage in the American Revolutionary War. Lanham, MD: University Press of America, Inc., 1999. ISBN 978-0-7618-1479-5. Misencik, Paul R. The Original American Spies: Seven Covert Agents of the Revolutionary War. Jefferson, NC: McFarland, 2013. ISBN 978-0-7864-7794-4. p. 122. Naylor, Natalie A. Women in Long Island's Past: A History of Eminent Ladies and Everyday Lives. Charleston, SC: The History Press, 2012. ISBN 978-1-60949-499-5. Retrieved May 1, 2014. Nelson, David Paul. Culper Ring in Hastedt, Glenn, P., ed. Spies, Wiretaps, and Secret Operations: A-J. Santa Barbara, CA: ABC-CLIO, 2011. ISBN 978-1-85109-807-1. Rose, Alexander. The Spy Who Never Was: The Strange Case of John Honeyman and Revolutionary War Espionage. In CIA Studies in Intelligence Journal, June 19, 2008. Retrieved May 30, 2014. Rose, Alexander. Washington's Spies: The Story of America's First Spy Ring. New York: Bantam Dell, a division of Random House, 2007. First published in hardcover in 2006. ISBN 978-0-553-38329-4. Schellhammer, Michael. George Washington and the Final British Campaign for the Hudson River, 1779. Jefferson, NC: McFarland and Co., Inc., 2012. ISBN 0786468076. Sharp, Arthur G. Not Your Father's Founders: An "Amended" Look at America's First Patriots. Avon, MA: Adams Media, 2012. ISBN 978-1-4405-4011-0. Tallmadge, Benjamin. Memoir of Col. Benjamin Tallmadge. New York: Thomas Holman, 1858. OCLC 15547874. Ward, Christopher. John Richard Alden, ed. The War of the Revolution. New York: Skyhorse Publishing, 2011. ISBN 978-1-61608-080-8. Originally published Old Saybrook, CT: Konecky & Konecky, 1952. Weigold, Marilyn E. The Long Island Sound: A History of Its People, Places, and Environment. New York: NYU Press, 2004. ISBN 978-0-8147-9400-5.